The #MAVEN operations team at Lockheed Martin is today beginning a campaign to shrink the orbit of the spacecraft to prepare for the arrival of NASA’s #Mars 2020 rover. Over the next few months, the aerobraking campaign will reduce the high point of MAVEN’s elliptical orbit from 3,850 to 2,800 mi (from 6,200 to 4,500 km) above the #Martian surface, which will prepare it to take on additional responsibility as a data-relay satellite for the 2020 rover. 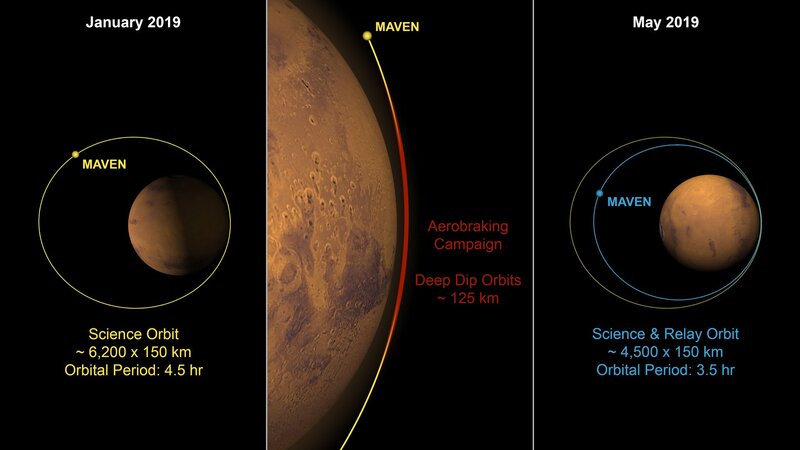 MAVEN has been making unprecedented measurements of Mars’ upper atmosphere, ionosphere, and interactions with the Sun and solar wind since it began its science mission in October 2014. Read the full story: http://bit.ly/2TLeB32.